June 15, 2016 In confronting terrorism, the U.S. needs to decide whether it is at war and who the enemy is. The slaughter in Orlando, Florida on Sunday once again raises the question of what we should do about attacks like this. But before that, we must answer a more fundamental question: Was this a criminal act or an act of war? Answering that question is the key to determining the appropriate response. If these are criminal acts, then the criminals must be punished for their actions. If these are acts of war, then the enemy forces must be found and destroyed, not based on what they might or might not have done, but in order to destroy the enemy before they can strike again. Since 9/11, the United States government has failed to resolve this issue. Immediately after the attack, President George W. Bush committed to bringing those who planned the attack to justice, implying that this was a criminal act. At the same time, he sent the U.S. military into Afghanistan to wage war on the Afghan government, its army and al-Qaida, which was operating under the government’s protection. That implied that this was war. While it seems intellectually fashionable to indulge in handwringing and say “nothing is happening” in India on the economic front, is that truly an accurate assertion or just the lament of the blind? Or more accurately, the lament of those who can see but don’t want to see? First a few facts. According to one estimate, India has overtaken China, for the first time, with the largest inflow of foreign direct investment (FDI) — $63 billion — making it one of the most attractive global destinations for capital. Private equity investments are close to an all-time high of about $15 bn as well. The $1.5 bn Ahmedabad-Mumbai high-speed rail link is happening as a result of a loan at 0.1 per cent interest over a 50-year time period from Japan — terms unbelievable by any yardstick of finance. Writing in these columns when the Agusta helicopter saga had hit news headlines earlier, this writer had concluded wistfully that if past performance was any indicator, the end would be predictable. A few reputations and careers of servicemen will be destroyed, the arms agents will move on to the next deal, and the real perpetrators and beneficiaries will live to enrich themselves another day. All that the nation will be left with are the service qualitative requirements with their sanctity open to abuse and the morale of the armed forces further eroded. Little did one realize that some of these reflections would soon come to haunt Indian governance, the institution of the Indian Air Force, its staff systems and processes. The Italian high court judgment, whilst confirming that bribes had been paid by various officials of AgustaWestland, has given ample indication to where in India they were gratefully received. The involvement of the big fish gets conveniently camouflaged and diluted in partisan politics, but there is no such respite for those in uniform. Not surprisingly, the then air chief seems to have become the focus of the media hype and, indeed, the target of the investigative agencies rather than being incidental to this entire episode, albeit with some accountability. How Much Longer Will Afghanistan Need America? Last week in these pages, some of the most accomplished and well-respected members of the U.S. military and diplomatic service wrote an open letter to President Obama with some straightforward advice: please keep the full contingent of 9,800 U.S. troops in Afghanistan in place so the next Commander-in-Chief (whoever that might be) has more flexibility to make an informed decision. Withdrawing to 5,500 U.S. personnel by the end of the year, the authors write, would have detrimental effects on Afghanistan's security situation at a time when the country is still suffering from a Taliban movement that refuses to quit. Pakistan’s regional isolation can’t be in its long-term national self-interest. Pakistan’s relations with Afghanistan recently has been one such example of a state caught and unable to define its foreign policy and national interest beyond Cold War paradigms. India-centric foreign policy thinking has stalled Pakistan’s foreign policy evolution and tainted its worldview. Pakistan has strained and difficult relations with all its neighbors, with the important exception of China. After the Kargil War in 1999, the hostilities between India and Pakistan shifted the country’s attention to its western border, to contain the very real risk of nuclear escalation between the two states. Pakistan did this while continuing its proxy war in Afghanistan. Pakistan’s foreign policymakers and military elite thought that acquiring the upper hand in Afghanistan and containing the warring tribesmen next door would be a much easier task. 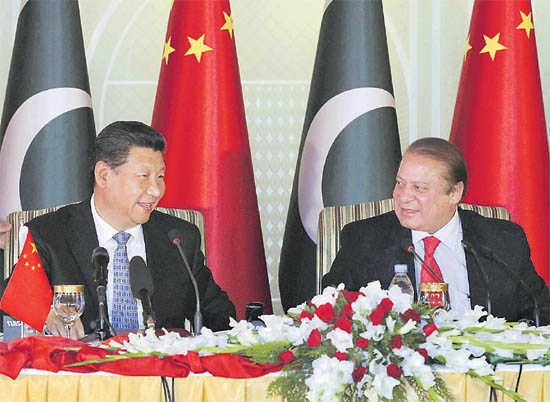 Ganging up: China is backing Pak-sponsored terrorism against India. NEW Delhi appeared “shocked” by China’s recent veto of action against Jaish-e-Mohammed (JeM) chief Maulana Masood Azhar, when there was widespread support in the UN Sanctions Committee to act against him for his role in the Pathankot attack. The UN declared the JeM a terrorist organisation in 2001. The former Director-General of the ISI, Lt-Gen Javed Ashraf Qazi, acknowledged in the Pakistan parliament in 2004 that the JeM was responsible for the attack on the Indian Parliament — an action that took the two countries on the brink of war. This veto was, however, not an isolated action by China which has long backed Pakistan-sponsored terrorism against India. China’s contacts with radical Islamic groups backed by the ISI is nothing new. It was one of the few countries that had contacts with high-level Taliban leaders, including Mullah Omar, during Taliban rule between 1996-2000. There was even a Chinese offer to establish a telephone network in Kabul during this period. Moreover, after the Taliban was ousted from power in 2001 and was hosted by the ISI in Quetta, the Chinese maintained clandestine contacts with the Mullah Omar-led Quetta Shura. China recently joined the ISI to sponsor the so-called “Afghan-led” peace process with the Kabul government. Beijing appears convinced of the need to have an ISI-friendly government in Kabul. The mandarins in Beijing evidently favour such a dispensation, in the belief that the ISI will rein in the Taliban support for Uighur Muslim militants in Xinjiang. They could tear it apart—or work together. On June 6, Khorasan Province of Islamic State claimed credit for the killing of Sher Wali Wardak, an Afghan parliamentarian. If confirmed, the killing will represent a new chapter in ISIS’s capacity to operate in Afghanistan. The attack happened as professors from Ghazni University in the eastern part of the country are warning of ISIS infiltration of the university, another sign that the group seeks to expand its base of support in the country. Elsewhere, Afghan media have reported that Al Qaeda is making efforts to strengthen its relations with the Taliban, which has been confirmed by Gen. Charles Cleveland, spokesman for NATO and U.S. forces in Afghanistan. While radical Islamists of various shades continue to conspire and thrive on Afghan soil, the necessary pushback by regional states and the international community is still not in place. Fighting radical Islamists in Afghanistan represents a golden opportunity for international cooperation, including the United States, Iran and Pakistan. History shows it can be done. Chinese intelligence operations worldwide to steal important information both through human agents and cyber attacks are a growing threat, according to experts who testified at a US congressional commission last week. Beijing’s spies, operating through the civilian Ministry of State Security and People’s Liberation Army Intelligence Bureau (IB), have scored impressive gains against the United States in particular, where economic espionage — the theft of trade secrets and high technology — remains at unprecedented levels. Technology espionage by China was highlighted by the conviction in California last week of Wenxia Man of San Diego who was convicted of illegally conspiring to export fighter jet engines and an unmanned aerial vehicle to China. Read the entire article at Asia Times. The recently concluded 15th Shangri-la Dialogue in Singapore once again focused on the South China Sea disputes. At the Dialogue, Admiral Sun Jianguo, Deputy Chief of the Joint Staff Department of China’s Central Military Commission, rebutted criticisms of China’s actions in the South China Sea and reiterated China’s legal right to ignore an upcoming judgement in a case filed by the Philippines at the Permanent Court of Arbitration at The Hague. As many governments and analysts view ASEAN’s reaction to this upcoming judgement as a gauge of its unity, it is timely to evaluate if Chinese foreign minister Wang Yi’s announcement of a four point “consensus” reached with Brunei, Cambodia and Laos in late April this year – which contained supposed agreements between the four countries on approaches to manage the South China Sea disputes, approaches congenial to China’s view of the disputes – was really a common agreement by all parties. This uncertainty over the “consensus” was shared by ASEAN Secretary-General Le Luong Minh. In a response to a question on 9 May in Singapore about it, he said that “we are not even aware of what was agreed with China and the three ASEAN countries…We’ve heard nothing from Laos and Brunei on what was agreed or what happened”. China’s brazen and “improper airmanship,” buzzing an American surveillance plane in the skies above the East China Sea last week, is but the latest signal of Beijing’s proclivity for risk and willingness to undermine both its regional reputation and economic stability in order to stake expanding claims in Asia. Western observers have not relinquished the perennial hope that China’s global economic interconnectedness will constrain its proclivity to military conflict. But this belief is misguided and not borne out by history. In fact, as China’s economic and military power rise, it has shown an increased tolerance for risk and raised the likelihood of future war. China has repeatedly harassed Indonesian, Vietnamese andPhilippine ships in the latter’s territorial waters, claiming that Chinese citizens have been fishing there “since ancient times,” entitling them to vast maritime sovereignty. Its island construction on top of shallow reefs is another component in Beijing’s strategy to assert dominance over the South China Sea. The near-collision of the Chinese fighter jet with the U.S. spy plane last week follows a string of gutsy, high-risk encounters. Only last month, two Chinese jets flew within fifty feet of an American EP-3 reconnaissance aircraft over the South China Sea. Many factors contributed to this situation, but perhaps the most significant are intellectual. For instance, the belief that ISIS’s (and before them Al Qaeda’s) propaganda is unheralded—typically highlighting slickly produced communiqués and use of social media as evidence—implies that history offers little for improving contemporary efforts. The long history of messaging during conflict suggests otherwise. As Professor John Arquilla suggests: “information strategy did not spring forth fully formed . . . It has formed and reformed, shifted shape and emphasis, for millennia. We ignore this long experience at our peril.” Indeed, the use of visual and aural (e.g., spoken-word) communication by combatants to boost the fighting spirit of comrades, win over neutrals and intimidate enemies predates even the ancients. Many Western analysts of terrorism, and of Middle Eastern politics, are bad at religion. They prefer empirical explanations for individual and group actions, and so they’d rather avoid wrestling with God. They’re also likely to see religion as infinitely adaptable, an “epiphenomenal” cover for political or economic grievance—or fertile ground for the mentally unhinged. Many in the secular West cannot imagine that a religion can meaningfully differ from privatized, post-Enlightenment Protestantism, which usually serves as their template for all public religion. Since Islam and Islamism today behave differently from Christianity in the West, these Westerners assume God’s obstinate presence in Middle Eastern politics is the result of some other process. Whether this stems from a lack of imagination, or from a belief that examining Islam’s theological particulars constitutes bigotry, the consequence is a refusal to consider religion on its own terms whenever it bleeds into the news. In other words, they fail to think like jihadis. Shadi Hamid’s new book Islamic Exceptionalism: How the Struggle over Islam is Reshaping the World is a notable exception. It limns the Islamist mind in unnerving detail. Establishing a continuum that stretches from Tahrir Square to Erdoğan’s Turkey to ISIS, Hamid makes the case for theology as a full-fledged analytical tool for political scientists. It is discouraging that in a country that justly prides itself on producing great scientific minds and creative thinkers, that on a few key substantive issues we fail to ask—much less answer—crucial questions. Drone strikes are one of the most glaring and egregious examples of this. These acts—which are sometimes called targeted killings, UCAV (unmanned combat aerial vehicle) strikes, or precision targeting—are at their most elementary level, killing human beings via remote control at a great distance from the target. In that sense, they are no different than an infantryman firing a rifle at an enemy combatant from three hundred meters away, a tank gunner destroying an enemy vehicle and its crew from four kilometers out or firing an artillery piece at enemy troops from a distance of over thirty kilometers. The justification for using drones, however, can be radically different from the standard we apply to ground combat. The Laws of War govern the behavior of ground troops, airmen and sailors in armed conflict. The laws were designed to keep otherwise violent and bloody wars from descending into barbarism, which sometimes strips victors of their humanity. The Department of Defense has strictly enforced these laws on our troops during Desert Storm, the long Iraq conflict and the ongoing struggle in Afghanistan. As the presidential campaigns launch into full swing, there is little doubt that debating the effectiveness of U.S. efforts to combat ISIS will take center stage. Critics of the current administration’s policy have argued that the strategy of containment to “degrade and destroy” ISIS has been ineffective. This camp asserts that ISIS is a long way from being destroyed and is not even being contained: ISIS has expanded its reach to other territories, increased its attacks on targets outside its borders, and its ideological appeal shows no sign of decline. Meanwhile, supporters of the current approach remind us that this will be a long war and also point out that Islamic State has lost significant territory, its finances are being depleted, its recruitment is down, and local counter-ISIS forces are getting stronger. Yet both views miss the mark about a crucial aspect of U.S. policy: containment. Cultivated in the early days of the Cold War to prevent the expanding influence of the Soviet Union, a massive state with a strong ideology and robust military, George Kennan’s interpretation of containment highlights its limitations within the context of ISIS. Containment cannot be applied the same way it was against ISIS, an elusive adversary that has the characteristics of a state, a transnational terrorist organization and a social movement. Moreover, it is much harder to contain an ideological threat than a military one, as the U.S. experience with the Soviet Union showed. It is essential that policy makers recognize what containment can and can’t do against ISIS. Forces aligned with Libya’s internationally backed unity government closed in on the center of the Islamic State stronghold of Sirte during the weekend, giving a boost to an administration struggling to unite the fractured nation. In the past three weeks, militias that recently threw their support behind the government captured about 80% of Sirte and on Sunday pushed deeper into the city, said Ismail Shukri, head of military intelligence for the militias. The offensive has been surprisingly quick and successful, military and intelligence officials said. Some 150 miles of Mediterranean coastline that Islamic State had controlled around Sirte has been reduced to about 50 miles in less than a month, the officials said. After more than two years under two rival governments that effectively split the country, Libya’s unity government moved into the capital Tripoli in March. But it has had difficulty asserting its authority across the troubled country. Panic over which future Islamic State affiliate should be of chief concern rises each day as the Islamic State loses turf in Iraq and Syria and foreign fighters flee. This panic should be muted, though, as all Islamic State affiliates are not created equal. A scary jihad map from al Qaeda last decade looks remarkably similar to a scary Islamic State map today. The names change but the places largely remain the same. Much like al Qaeda affiliates eight years ago after jihadi battlefields in Iraq and Afghanistan cooled, only a few Islamic State affiliates will grow while many others wane. Anticipating which Islamic State affiliates will rise and fall in the coming years requires a deeper examination of the current construct of each affiliate, the bonds that bring affiliates closer to the Islamic State, the convergent and divergent interests between headquarters and the affiliates, and a long-term outlook for each region. Examining these factors across 16 current or potential affiliate regions paints a dire picture for the Islamic State as an enduring cohesive global terrorist organization. Its strongest current affiliates in North Africa and the Arabian Peninsula face stiff competition from local rivals and rising counterterrorism pressure. For the Islamic State to endure beyond Iraq and Syria, its options are few and depend more on its ability to self-finance than any other factor. In February, a radiological source went missing in Iraq. There was concern that ISIS might have gained control of the radioactive material and planned to create a Radiological Dispersal Device (RDD, commonly referred to as a “dirty bomb”) by using explosives to scatter the material over some target area. Fortunately, the radiological source was recovered, abandoned in Iraq, a few days later. Thousands of radiological sources are used in the United States for various medical and industrial purposes. Many more are used overseas. In the past, a number of these sources have been misplaced, and in a small number of the foreign cases, this has led to serious contamination, including a few deaths. Efforts have been made to better control these radiological sources, but since at least 2001, there has been increased concern that terrorists might use them to create an RDD. Calculations have shown that an attack would be unlikely to produce radioactive contamination sufficient to kill or even injure anyone. The only direct medical effect from such an attack would be an increased long-term cancer risk. The immediate impact, therefore, would be mainly psychological and economic. Governmental authorities would declare the more heavily contaminated areas off-limits. Some people might avoid any area where contamination was detected, no matter how slight. If an RDD were used in a major urban area, the economic losses could be in the billions or even tens of billions of dollars. WASHINGTON (AP) — Sophisticated hackers linked to Russian intelligence services broke into the Democratic National Committee’s computer networks and gained access to confidential emails, chats and opposition research on presumptive Republican nominee Donald Trump, people familiar with the breach said Tuesday. CrowdStrike Inc., a cybersecurity firm, said the DNC asked it to investigate a suspected breach of its systems that began as early as last summer. CrowdStrike said it quickly found traces of two of the best adversaries in the hacking arena, both tied to the Russian government. The newly revealed attacks join a host of high-profile digital breaches affecting current and past White House hopefuls, underscoring vulnerabilities in digital networks that increasingly hold sensitive data about political candidates, their opponents and their donors. DNC Chairwoman Debbie Wasserman Schultz called the incident serious and said the committee moved quickly to “kick out the intruders and secure our network.” The DNC said donor, financial and personal information did not appear to have been accessed by the hackers. But an individual knowledgeable of the breach said at least one year’s worth of detailed chats, emails and opposition research on Trump were stolen. That kind of research, a staple of political campaigns, often contains detailed information — sometimes factual and sometimes specious — about a candidate’s personal and professional history. In March of this year, Iran conducted tests of two variants of the Qadrmedium-range ballistic missile. Shortly afterwards, a group of GOP senatorsintroduced new sanctions legislation which included provisions sanctioning persons and entities involved with Iran’s ballistic missile program. For decades, the most contentious issue between Iran and the United States was the former’s nuclear program. Following the signing and implementation of the Joint Comprehensive Plan of Action (JCPOA), this has changed. To be sure, the nuclear deal itself still generates quite a debate, but Iran’s actual nuclear program has fallen out of the world’s attention. Nature abhors a vacuum. It was only a matter of time before another issue took the place of the nuclear issue as the most intransigent point of contention between the U.S. and Iran. It would appear, from all indications, that Tehran’s ballistic-missile program will soon assume that dubious position. Indeed, the missile issue seems to be picking up right where the nuclear one left off. Instead of repeating the same counterproductive diplomatic strategy, however, it’s time we learned from the past. It would be a similar mistake to approach Iran’s ballistic-missile program with the same political and diplomatic myopia that characterized both sides’ approach to the nuclear issue for decades. In fact, Iran’s missiles should not even be on the agenda at this point in time or, at the very least, they should not be an immediate diplomatic priority. There are several reasons for this. Global infrastructure systems are straining to meet demand, and the spending trajectory will lead to worsening gaps. But there are solutions to unlock financing and make the sector more productive. The world today invests some $2.5 trillion a year on transportation, power, water, and telecommunications systems. Yet it’s not enough—and needs are only growing steeper. In a follow-up to its comprehensive 2013 report Infrastructure productivity: How to save $1 trillion a year, the McKinsey Global Institute finds that the world needs to invest an average of $3.3 trillion annually just to support currently expected rates of growth (exhibit). Emerging economies will account for some 60 percent of that need. Oil and natural gas prices are low. Western sanctions over Crimea continue to bite. Declining revenues have led the Russian government to demand another double-digit cut in state investment programs and administrative costs, with social spending likely also to take a hit. What Russia needs most is smart, technologically driven investment to shed its dependence on commodity exports and focus on diversified sources of growth. What it’s getting instead are regret-laced waves goodbye from many of its top thinkers and creators. Those most likely to propel the country forward are instead charting their paths elsewhere. Russian government statistics show a sharp upturn in emigration over the last four years. Almost 123,000 officially departed in 2012, rising to 186,000 in 2013, and accelerating to almost 309,000 in 2014 after the annexation of Crimea and even more in 2015. These statistics probably underestimate actual flows, however, as many people no longer notify the government that they’re leaving. During previous emigration waves, permanent exit involved annulment of residence registration and surrender of Russian documents. Now, it is much more common to remain connected to Russia through business and/or apartment ownership, or by working for a Russian company through the internet, while obtaining long-stay visas and effectively moving abroad. Editor’s Note: The following is drawn from remarks that Ambassador Chas W. Freeman, Jr. delivered at a meeting at the Center for the National Interest on June 9. The article originally appeared on his blog here. I have been asked to speak about the geopolitical dynamics of the Middle East, the realignments occurring among states there and the prospects for the achievement of renewed stability in the region. I’m tempted to suggest that you read my latest book, America’s Continuing Misadventures in the Middle East. So much has gone wrong that it is hard to be either brief or optimistic. Two hundred and eighteen years ago today, Napoleon was preparing to take Malta. His purpose was to clear an obstacle to his seizure of Egypt for revolutionary France. He was able to invade Egypt on July 1, 1798. Napoleon’s campaign there and in Palestine kicked off a two-century-long effort by the West to transform the Middle East. European imperial powers and, latterly, the United States, have repeatedly sought to convert Arabs, Persians and Turks to the secular values of the European Enlightenment, to democratize them, to impose Western models of governance on them in place of indigenous, Islamic systems, and more recently to persuade them to accept a Jewish state in their midst. The Obama administration wants to get an agreement on Ukraine before the November elections. Like most presidents, Obama’s aims changed significantly as new challenges emerged and evolved – from Russian aggression in Ukraine to the rise of the Islamic State in Iraq and Syria. Obama’s second term has been a time of gridlock in terms of many domestic policy goals. But some long-running diplomatic initiatives came to fruition, namely the Iran deal and rapprochement with Cuba. Nevertheless, as the presidential election nears, pressure is growing in the White House to fulfill some policy goals that the administration worries the next president may not be able to – or may not want to – achieve. Coming to an understanding with Russia regarding the future of Ukraine before Obama leaves office is now a pressing matter for the White House. National Security Advisor Susan Rice spoke with the Washington Post on June 9 and noted that the U.S. is intensifying its efforts to work with the Russians, Ukrainians, Germans and French to reach a deal and implement the February 2015 Minsk Accords. Rice said, "We are hopeful if the Russians want to resolve this – and we have some reason to believe they might – we have the time and the wherewithal and the tools to do so." NATO HQ: It’s taken a while, but NATO Secretary General Jens Stoltenberg announced here that the 28-member alliance has agreed to declare cyber an operational domain, much as the sea, air and land are. The really important result of this is that, for the first time, a cyber attack could trigger Article 5, the core NATO language that mandates an attack on one country is an attack on all. This clarifies some strategic ambiguity and assuages a major concern of allies like Estonia, victim of Russian cyberattacks in 2007, who feared Russia could bring them to their knees electronically while the rest of NATO stood by. No more: “We have decided that a cyber attack can trigger Article 5,” Stoltenberg told reporters in an end-of-day press conference. Declaring cyber a domain will mean NATO “will coordinate and organize our efforts to protect against cyber attacks in more efficient and effective way. It also will help defend individual nations defend their networks.” The secretary general also said the alliance will work closely with the European Union on cyber defense and related issues. Given how intertwined domestic and military networks can be, that certainly makes sense. Cyber attacks are a constant threat to businesses around the world with vast sums of money being spent to protect against them. The image of some nefarious character plotting in his or her bedroom is one most of us have when thinking about hackers and cyber criminals. While in 2015, 40 percent of attacks stemmed from 'outsiders', a surprising 60 percent were actually perpetrated by company insiders. IBM, who produced the figures based on information from over 8,000 of their clients devices, revealed that although 15.5 percent of such 'attacks' were caused inadvertently, 44.5 percent were deemed to have been malicious. An insider is defined as anyone who has physical or remote access to a company's assets. IBM note that although this would often be an employee, it can also mean business partners or maintenance contractors - people you trust enough to grant system access to. Insiders not only have this access, they may also be aware of your weaknesses and thus exploit them more effectively than an outside agent might be able to. This chart shows the type of people that committed cyber attacks in 2015. Fred Kaplan's 'Dark Territory,' on key cyber warfare incidents in the last 30 years, offers some tasty tidbits about Israel, that self-declared cyber powerhouse. The book’s title refers to a comment made by former U.S. Secretary of Defense Robert Gates during the dog days of President George W. Bush’s tenure in the White House. “We’re wandering in dark territory,” he would say about cyber war, using the term originally used on U.S. railroads to describe stretches of track uncontrolled by signals. The announcement that NATO would deploy four battalions of troops to the Baltic republics and Poland is merely the latest evidence that Western officials are utterly tone deaf about how their actions are going to be received in Moscow. The apparent assumption is that such a vigorous display of determination to protect the security of the Alliance’s vulnerable eastern members will cow the Kremlin and prevent any inclination to engage in coercive measures. Those officials seem oblivious to the notion that even reasonable Russians, much less the somewhat paranoid crowd gathered around President Vladimir Putin, might regard NATO’s moves as menacing to Russia’s core security interests. It is an attitude that Western leaders need to alter drastically before the current, rather chilly, relationship with Russia escalates into a full-blown second Cold War. Indeed, the ongoing tensions have the potential to escalate into an armed conflict with nuclear implications. And unlike the original Cold War, in which Moscow bore most of the blame for the confrontation, this time the United States and its allies have that dubious distinction. 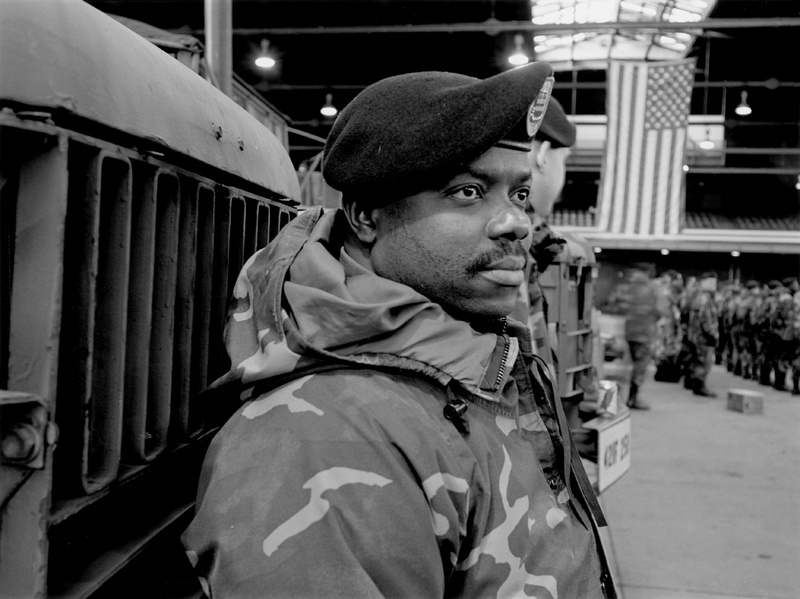 An Army National Guardsman at the armory in Jamaica, Queens, where he and other soldiers were gathered for deployment to Iraq, January 2004; photograph by Thomas Roma from his 2010 book Dear Knights and Dark Horses. It includes an introduction by Alec Wilkinson and is published by powerHouse. Since 2001, at least 2.5 million members of the American armed services have deployed to Iraq or Afghanistan. Among returnees, between 11 and 20 percent are estimated to suffer in any given year from post-traumatic stress disorder (PTSD), according to the Department of Veteran Affairs. The PTSD label is loosely used, but under the clinical definition of the National Institute of Mental Health, an afflicted person may experience for at least one month a combination of symptoms including flashbacks, bad dreams, guilt, numbness, depression, sleeplessness, angry outbursts, and partial amnesia. The sheer size and diversity of this injured population are astounding. Newspaper reporters including Dana Priest and Anne Hull of The Washington Post and David Phillips, now of The New York Times, have documented the military’s shabby, at times cynical response to this social and medical crisis. The subject has also given rise to memorable written accounts of personal experience. David Finkel, in his remarkable book Thank You for Your Service, chronicles returning veterans of brutal combat in Baghdad and presents nuanced accounts of dysfunction, suicide temptation, and redemption. Matthew Green, in his book Aftershock, introduced British readers to the same crisis and showed how that country’s military health system has failed to reduce the stigma of PTSD. Redeployment, a collection of short stories by Phil Klay, a former Marine officer who fought in Iraq, which won the National Book Award in 2014, is one volume among several that suggest the emergence of raw, distinctive fiction by and for America’s post–September 11 generation that sometimes touches on the PTSD crisis. Classic works have a great deal to tell us: they furnish a starting point for assessing our situation, and they keep us grounded. These are both vital functions. Just ask Rudyard Kipling. In 1919 Kipling published a poem titled “Gods of the Copybook Headings.” Copybook headings were proverbs or maxims that British schoolkids used to copy over and over to practice penmanship. There was a heading at the top of each page, and the students would copy it over and over to fill the page. Therein lay wisdom.